This bias and disrespect needs to be called out. Anne Thom, PUC Consumer Affairs Supervisor, (yellow tag) with other PUC staff. The latest example happened at the PUC’s Thursday hearing, the final meeting approving the new Line 3 tar sands crude oil pipeline that would run 337 miles through northern Minnesota, crossing the Mississippi River headwaters. At the hearing, the PUC’s Consumer Affairs Supervisor Anne Thom told Lindsay Harding, a pipeline resister, that she had to take off her bib overall snow pants if she wanted to attend the hearing. According to Harding, Thom told her that the snow pants qualified as a “coat,” and coats were not allowed in the hearing room. Harding had good reason to wear her snow pants that day. Because these hearings drew large crowds, she and others would arrive early to get in line for a good seat. At previous hearings, people had to wait outside the building in the cold before it opened. For the Thursday hearing, Harding again showed up early and dressed warmly. On this occasion, she and others were allowed in relatively early. But now Harding was incredulous to learn that her snow pants counted as a coat and had to be removed. Harding tried, unsuccessfully, to register a sexual harassment complaint with the PUC’s Human Resources Department, she said. She found a woman who identified herself as being with human resources and was explaining her story. According to Harding, Thom was present and said if Harding continued to talk about the incident, she would not be allowed into the hearing room. Thom was reached by phone and referred all media questions to PUC Executive Secretary Daniel Wolf. Calls to Wolf Thursday afternoon, Friday morning and Monday morning have not been returned, nor was a Monday email. This was not the first run-in that Line 3 opponents had with Thom. Some background is in order. The PUC acts as a quasi-judicial body. That means only recognized “intervenors” get to participate in the hearings, speak directly to PUC Commissioners, present evidence, answer questions, and cross examine witnesses. Attorneys usually represent intervenors but the rules don’t require it. Self representation became a thorny issue between Thom and the Youth Climate Intervenors, a group of 13 indigenous and non-indigenous young people granted status as a formal intervening party. The group earned a seat at the table by arguing that young people would be most affected by Line 3’s long-term climate damage. The youth couldn’t afford legal counsel. As they each also had jobs and/or classes, they divided the work among themselves, according to Akilah Sanders-Reed, one of the youth intervenors. Some developed expertise in environmental issues, some developed expertise on the link between pipeline construction and human trafficking, and so on. The PUC limited Youth Climate Intervenors to five badges a day, Sanders-Reed said. The badges designated who could speak to the PUC. The other eight youth were considered members of the public and could not speak. On some days, the youth gave badges to their expert witnesses, such as climate experts, further reducing the number of youth who had access to badges. The youth faced further restrictions. The five people with badges had to be present at the start of the day, Sanders-Reed said. If a youth had to leave at some point for class or work, that person couldn’t give their badge to another Youth Climate Intervenor in “public” seating. That meant that — depending on the questions asked by the Commissioners — the Youth Climate Intervenors didn’t necessarily have the person at the table with the greatest knowledge on the topic at hand. Andy Pearson, an organizer with MN350, said the rule the PUC imposed doesn’t exist in law and was not disclosed in advance. Thom and the PUC have “never provided legal justification for this,” he wrote in an email. The PUC instituted a ticketing system to deal with the large crowds attending the Enbridge Line 3 hearings, first come, first served. People would arrive very early to get in line so they could get into the main hearing room. (Latecomers otherwise had to watch on a video screen in an overflow room.) Some people on both sides of the Line 3 issue would arrive early simply so they could get main hearing room tickets to swap with organizational leaders who arrived later. Thom and the PUC instituted ticket swapping rules. These rules were not always clear and had big consequences. At a June 26 PUC hearing, Thom accused Sierra Club organizer Natalie Cook of breaking the ticket swapping rules; Cook said she was complying with posted rules. Without giving Cook an initial warning to comply, Thom had police evict Cook from the building. Thom even told Cook she had a year-long ban from Metro Square (the building where the PUC has its offices). It didn’t stick. Honor the Earth was one of the intervening parties in the Enbridge Line 3 case. When Honor the Earth’s Executive Director Winona LaDuke arrived at a Nov. 19 PUC hearing, Thom said she couldn’t go into the main room because it was already full. It seems Thom could have easily made accommodation, finding someone in the hearing room who would happily give up their seat to LaDuke because of her leadership. For whatever reason, Thom did not. Sen. Patricia Torres Ray was present and was upset by what she saw — LaDuke is “an important voice on this issue and should be in the main room,” she said. Sierra Club attorney Leili Fatehi attended Thursday’s PUC hearing and intervened on Harding’s behalf in the snow pants dispute. She is looking into filing an official complaint. “This is a systemic issue that needs to be addressed,” Fatehi said in an interview. In a way, the snow pants are a metaphor for the arbitrary way the PUC makes decisions. The Minnesota Department of Commerce told the PUC that Enbridge’s Certificate of Need application for Line 3 had failed to meet a basic requirement in state law and should be rejected. State law required Enbridge to provide a demand forecast for crude oil to justify the new pipeline and it did not; the PUC ignored the plain meaning of the law. Line 3’s environmental impact statement said that the pipeline would generate $287 billion in climate damage over three decades, an enormous public cost; the PUC ignored it, saying the science was imprecise. Anishinaabe nations argued Line 3 violates their treaty rights; the PUC refused to acknowledge that treaty rights remained an unsettled and legitimate issue, in spite of case law to the contrary. The Administrative Law Judge’s Line 3 report said the PUC should not approve Enbridge’s preferred route because the costs outweighed the benefits; the PUC seemed to arbitrarily reject this major conclusion. What is the public to think when the PUC veers from the public record and sides with a foreign company? 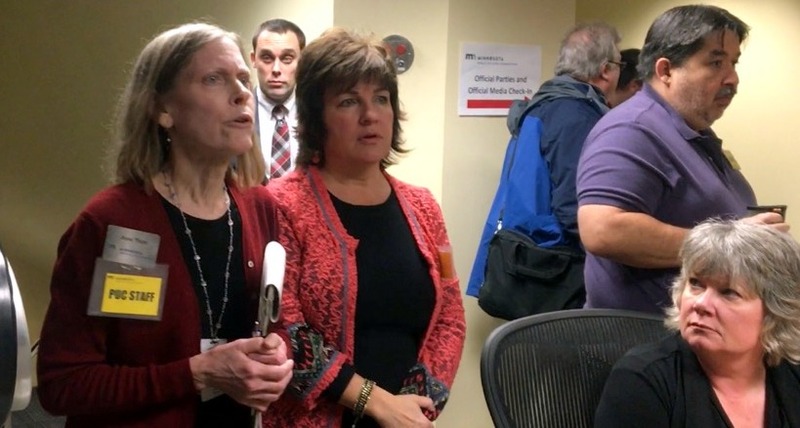 What is the public to think about the culture at the PUC when a PUC staffer makes a woman strip to her long johns in order to attend a public hearing and no one else on staff speaks out? It’s the PUC that has no clothes. Disclosure: The blog’s author volunteers with the Sierra Club on Line 3 issues and has attended numerous PUC hearings. He is not speaking on behalf of the Sierra Club.